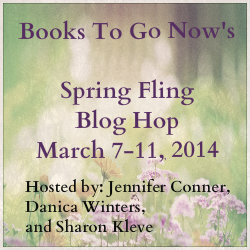 Books to Go Now Blog Hop! Hi everyone! Welcome to the Spring Fling Blog Hop! I hope you will take a few minutes to explore my website. Be sure to sign up for my newsletter to receive a FREE book from my bookshelf. My giveaway is a $10 Amazon Gift Card! tell me which of my books you'd like most to read and why. You HAVE to tell me WHY for your entry to count. If you've already read them all, tell me which was your favorite and WHY! Also, when you comment below and answer my scavenger hunt question, be sure you include your name and email in the comment for an entry toward the GRAND PRIZES! Click on the graphic above to get to the blog hop list. Visit and comment on as many blogs as you can to up your chances at winning the grand prize! I tried to answer your question by commenting, but wordpress is being mean and not recognizing me at all this evening. Hmm, maybe Chasing Sam. I love shifters, in general, and I’d like to see how that world contrasts with nobility. I would love to read Beating Hearts. Saving Margret looks like a fun book I like the idea of two species. SAVING MARGARET intrigues me, because I like the idea of incongruous shifter mates! Thank you all for participating. I hope you found some great books to read along the way!